On November 13 I wrote that work on C2 is" going very fast now as I've caught up the groove of the book and it should be done by week's end." Well since I wrote that I haven't written a word on the book. That was a Tuesday, leaving me plenty of room to write the remaining 8000-10000 words on the ms. before the week played out. And on Wednesday I did get up with every intention of hammering on the ms. but decided to to to post office instead. What greeted me there was a notice from our lovely IRS reporting a failure to file some Social Security paper on Todd way back in 2003. A call to the IRS yielded little of anything of value and left the phone on speak for awhile. 2003 was a few weeks ago and it took me some time to unearth boxes of filed taxes and sort through the mess in search of said forms. They were no where to be found. Todd worked for us then as Office Manager and it turned out he had electronic copies of those files as he filed electronically. The information, he suspected, was of course on his computer. But alas that was 4 years ago, before laptops were invented, and he had long since abandoned that machine. We retrieved it from the scrap heap that is the store room, got a monitor, plugs and electricity to power it all up and were greeted with a beautiful blue screen. Nada. Data only the good Lord knows where. A job for Jason. Suddenly it was time for dinner. Thursday found me a little annoyed and even before I was awake I was reading several emails about contract problems. I tracked those down, sifting through the folders and files on the external drive (I"m still porting over mess from one computer to a new one)found them and moved them to my desk top, read through them and promptly forgot about them (my desktop is where they sadly remain). My annoyance had grown into an irritation and I spent some time reorganizing electronic files and deleting duplicate mess. About that time I received an email from Gary asking some sales numbers questions. This sparked a return to the excel and an attempt to log onto a particular distributor's site to download sales figures as they don't send them via snail mail anymore. Of course my password and login were gone and as I created them some five years ago I had long since lost records to them. Back on the phone with tech support (I think I mentioned this in an earlier blog) but got no where. Turning my attention to email I noted a few orders, went to the mail room and packed stuff for the better part of the afternoon. I tried to work Thursday night on the module but was too tired and spent some time staring at stupid crap, stupid people do on youtube before retreating to my book on Sitting Bull and promptly falling asleep in my chair. Staggering off to bed around three . . . .
Friday found my mood foul and possessed of no desire to work. So I cleaned the mail room, print shop and office. During this latter event TLG was struck by a great tragedy. The hardest working member of our staff up and died. Right in my arms the paper shredder breathed its last and expired. I was distraught for without this machine I knew that the office would soon be lost in a mountain of loose leaf papers! The weekend saw some house painting, installation of guard rails, a small house fire and quite a bit of demolition. The stove had to be removed and replaced. The wife bought a new one and I installed it on Monday along with a bunch of electric mess on the porch. Before I realized what the heck had happened it was Tuesday again. C2, alone, neglected, untouched on my computer languished in a dreadful pool of its own wants. glared at me from my inbox. So I spent the better part of the afternoon praddling off answers, requests, job descriptions and excuses. I worked only a half day on Wensday, and those hours I spent at the post office and creating new templates for Quarterly reports as I've only just now converted all the old files from Quatro Pro to Excel. I took the weekend off as we had some 20 guests at the great Autumn Feast we call Thanksgiving and many lingered beyond the fattening meal of turkey, dressing, taters and pie to visit and hang out. By Sunday the last of them meandered about and I set to preparting myself for another week's work. But Monday and Tuesday and Wednesday were destined to be consumed with mountains of data entry. All those files I had updated and templates created were begging for some attention. I spent hours (ask Peter, I yelled at him a bit for disturbing me...though he's pretty used to it I suspect haha) plugging numbers in and compiling the data necessary to better track our sales and see what is doing what, trends, etc etc This will hopefully pay off in the long run. But all this data entry squandered my week's writing desires and left me with an intense dislike of numbers. The one bright spot in all this number crunching was the arrival of my new swivel chair with wheels. To date I've been sitting in a regular, hard, dining room chair. My desk is about 10 feet long and it has proved very annoying these past several months to hop down the length of my desk on this chair (though I've used this desk for about 2 years, I've only recently cleaned the far end of it off, allowing me the freedom to actually use it), an act I do by grasping the underside of my chair and pushing with my feet and pulling with my hands to 'bounce' or 'hop' down the length of the desk. Well my new chair arrived Tuesday the 26th and I took a little time off to assemble it . . . an annoying act in an of itself as it was assembled with an allen wrench, one of the most annoying tools invented by man (screwdriver anyone?????). There you have it, the Anatomy of Delay. With a little luck I should be able to tackle this ms. tomorrow and with a quiet weekend planned, maybe, just maybe . . . .
p.s. For some reason this song captures the spirit of TLG, I'm not sure why...Tom Arnold in the movie The Stupids. Be sure to listen to the lyrics and be careful this file is set on repeat so it will play over and over and over and over!!! Lets see how this goes. My daughter keeps wanting to help me type. I have enough problems on my own without a two year olds help. I will skip any entries about the actual rules presented and simply address seom of the concerns that have come up on our message boards. For many players some of the optional rules will become standard rules. That is the intent of course. 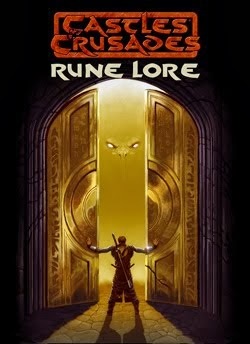 For some players, some of the rules are already standard or derivations and similar rules already exist in their games. Castles and Crusades was designed to be fooled with. We have long encouraged players to add, subtract and amend rules to fit their needs and desires. What the CKG does, is give them some of the options available to them and should (in an ideal world) teach others how to amend rules to fit their needs. In that regard , we have borrowed ideas from every edition of the game and incorporated them into ‘rules sets’ which can be taken and used. The important aspect of this, is that no optional rule exists in and of itself. An optional rule exists in relation to a choice. The CK and Player must choose which optional rule they are going to use because many are mutually exclusive. A simple example is with critical hits. There are 3 optional critical hit rules. They go from the simple to complex. A choice of one would have to be made – if at all ! I say the last because the section is preceded by the reasoning why critical hits are not included in the standard game and why it may not be wise for players to want to use the. Ultimately though, it is up to the CK and players to decide. There can be no standard rule. Which brings up an issue I am willing to fix now. I did have a listing of CnC standard optional rules. That is, those rules which we here at TLG use or would use were we so inclined and which met with the premise of our initial design. In retrospect, I will remove all reference to those and they will simply remain optional rules. In all, there will be standard set of rules to use but rather, sets of rules which work well together, mutually exclusive rules etc. Not a single rule has changed and, other than a few things like class advancement, more weapons and perhaps a few more spells, have been added to. Gamers. As for our game, it shall remain sweet and simple. Breathe easy, its not a core book. Don’t buy it and don’t let your players see and if they should, dock ‘em 50,000xp. It would be nice to know what you expected – because there is more. Many people who play left 3x. I would guess roughly ½. That number will increase with time. Many come over for the simplicity of use and ease of manipulation. I know of only a few who play CnC but do not incorporate rules from 3x. We get requests all the time for explanations on how one would go about incorporating x and y rule. The CKG will go a long way to alleviating their rules creation problem by offering ready made examples or at least the method by which the rules can be brought in. We are trying to give everyone who plays the tools to tailor their game as they see fit. Steve is checking into a title change as we speak (distribution channels). AS with you, he does not like the title and really does not like the 3 book paradigm. No optional rules will be included in the CnC modules – at least not to my knowledge. None that I will write anyway. I imagine if it were the case we would note it on the cover and make them available for free. Well, tonight I sat down to start penning some words for the Castle Keeper's Guide. Lucky me. For the most part I am working on organizational issues. But there are a few tidbits you might like to know. The classes will go up to 24th level not 20th. On this, the game (like the original and many incarnations since) was designed for play up to about 13-15 level. For CnC, 12th level is the unofficial retirement age for a character. In part this reflects the game mechanics and design and considers the length of real time it takes to get a character to 12th level. That said, the classes make a quantum leap in power as they advance beyond 12th level. 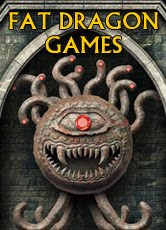 The game will necessarily change as the characters begin to outgun 90% of the monsters in the book. This is fine. The characters, after 12th level, approach hero status. Much along the lines of aragorn, gandalf, conan, the gray mouser etc. The characters become difficult to kill and they simply outmatch many creatures. Also consider, this is CnC power -ups so don't expect some aweful stuff. For example, the fighter gets a 2nd weapon specialization at 12th level, combat dominance extends to all 1hd creatures at 14th level then to all 2hd creatures at 16th level, an attribute bonus is gained at 15th level and at 21st level a really cool Battle Maneuver ability is added (using 1/2 BtH as AC bonus or damage bonus or any combination thereof.) and some other junk. We are putting the final touches on some optional rules. One that many may like and many may deplore are extra abilities. At various levels a character gets to add an extra ability to their character (a rogue for example gets them at 1, 2, 6, 11, 16 and 21 lvl). These extra abilities do increase the power of the players but are there for those who might want to dabble in them. These include things like enhanced spell resistance, fiersome blow, expert miner etc. and well, some other junk. Additionally there is a section on how to simply switch out abilities for others. In all what will happen is that certain sets of rules will natuaraly fit together while other not so much. we are also trying to explain how the SIEGE engine works and how it can be taken apart and rebuilt to fit your level of detail, style of play and creating new and applying it. For example, many people explain the Siege Engineby saying you have to beat a CL18 to succeed at a task . If the task related to your prime you get a +6 to that roll. A 12/18. Well, the actual original CL was 20. With size attributes you get a 0/2/4/6/8/10 (simplifying to a 12/18). In this case every attribute would be assigned a bonus. 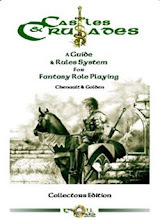 If you chose a primary, secondary and tertiary attribute system you go with 0/4/8 for low fantasy and 2/6/10 for high fantasy (character succeed 20% more often). So, taking this you could have humans with 3 primes, demihumans 2 primes, humans 2 secondary, demihumans 3 secondary, humans 2 tertiary and demihumans 1 teritiary or any break up u see fit. anyway, i show how the system can be broken down. 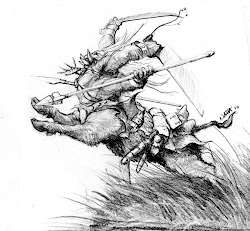 races - a new halfling !!! Anyway, as I work on things I will start posting them. At long last it seems as if I have control of the paper work on my desk. I still have lots of mess to catch up on, but this mess is filed away in one of the two filing cabinets we have here and I can't see it, so it makes my slate appear clean, even if its not. Things have slowed this past week so that has allowed me to play catch up. Most of the orders have gone out, there are still some problem children here abouts, most of them with Goodman Games products attached to them. The shopping cart on our website is supposed to link to Joe's site, not mine, so we've been getting orders for his books and we really don't stock them here. But we'll get it straightened out shortly. Last Friday saw Peter and I working on the large Darkenfold map. He's turned over a 24 x 30 inch rough map upon which I'll go through and enter the various place names. Once that's done I'll turn it back over to him for finalizing. I'm hoping that this will make its debut with C2. Speaking of which, I bailed on all things mundane to work on C2 Shades of Mist yesterday. I had to delete about 700 words, but wrote a further 3800 so I had a nice net gain of over 3000 words. Its going very fast now as I've caught up the grove of the book and it should be done by week's end. And with a little luck I'll be able to put a wrap on Crusader 8 articles and get that to editing. I spent the better part of today working on Aihrde Folio material, prepping it for upload on RPGNow which may happen as early as this afternoon. Its a rather bothersome and time consuming task as the covers have to be formatted for the downloads and another file formatted for the pic on the site. Each file will need its own cover and pic, and there are six maps and two books. So it took a few hours to prep all that mess. This afternoon I tackled a bit of admin stuff and resumed shipping of orders. Had a nice long wait at the post office as several stamp people gathered a bit of moss in front of me. No bother though, I was tired and just stood there. Its about time we talked about a few projects that have been lingering around here for awhile. Namely the CKG, CC Basic, Gord the Rogue and KoE KoF. Easiest first. Gord is set to go to print tomorrow. It should be making its debut in bookstores around the time of Christmas. We had a few galley copies made for Gencon but these didn't arrive on time and when they did there was some problems. So for those who have orders out there, look for them being filled very soon. KoE/KoF is being worked on by Alvin Helms. He's been the designer for Crusader Journal for the past 3 issues and from what I've seen on the game so far it looks amazing. He's working on a playtest version we can get to some distributors to get the game some better exposure. This should be complete any day now. When its done we'll post some stuff and let folks have a sneak peak. CC Basic is my puppy from start to finish. Davis will look over everything when its done, but I'll do the lions share of the writing. Some of this is done, most of the class work and sundries, but it does need playtesting. As soon as it gets a little further along I'll hunt down some folks. I already know the volunteers I'm going to pick to run the puppy. I will commence work on this again after C2 and Crusader 8 are finished and in editing. Hopefully that will be in the next week or so. I"m going to work hard for this product to make it by Christmas. Damn hard. Castle Keepers Guide: Davis is working with some of our best writers on this project, including Casey Christofferson. They have turned over quite a bit I know and Davis has been organizing it in files ready for first round of content reading. Much of this will need playtesting at some level, but that shouldn't hold it up too much. I know folks have been looking for this for a long time, but for the first time in over a year it has our full attention. In fact its just about all that Davis is working on. I had hoped to see this out by Christmas. I was confident that it could such a release, but I'm beginning to loose that confidence. But there is many slip between a cup and a lip and maybe we'll pull it off by then after all. I know its not much info, but its a bit and it does keep us all abreast of what's going on...sort of. Okay, I couldn't figure out how to link in my reply to James' madness. But he mentioned the song "Dancing Queen", that is a song by Abba. Not Blondie. For those you who don't know, or who have not been exposed to great glory that is Blondie take a moment and enjoy perfection. Here she is where she got her start, at CBGBs at the Apollo (this one is very good). Weeks like this one are always interesting around here. The Mail Room is attached to my office here, so the trip from my desk to the packing area is about 15 feet. The trip is pretty seamless from one room to the next. The wall dividing the two rooms has bulletins pinned to it (Mostly urgent stuff that I'm supposed to attend to, much of it dating from 2005, 2006 and some little from 2007) and a huge wire rack that we salvaged from a dumpster about six months ago. Its filled to the brim with the various hundred or so titles we've put out over the past several years. Passing through the door puts you in a room about 20 by 50 feet or so and its filled to the brim with giant racks filled with books. All these are stacked in nice stacks and represent 7 years of publishing. There are two large tables, one for processing and packing orders, the other for assembling products and shrink wrapping. These have shelves under them stacked high with supplies such as packing, tape and other sundries. There are a mix of shelves and and file cabinets all filled with jumbled items gathered but not discarded or filed over the past many years. Mixed in with these are tools for the truck, oil, wracking for cons, posters, extra computer equipment and boxes, boxes and more boxes. Presently the mail room has 6 extra boxes piled on the floor. These house the components of the East Mark Folio, signed by Gygax. We have a mountain of pre-orders on this thing as well as more orders that have come in over the past week. I've been out of pocket and Davis and Mark out of sight so things have stacked up around here. Its alot of orders. And they have to be shipped. So I sit and assemble them at one table, stacking them on the other. When I get 10 or so done I wander over to the packing table and do up the boxes and address them and drop them in a bigger box to carry to the post office. So each day this week I've taken a few hours and wandered into the Mail Room and begun assembling these Folio sets and sorting through the orders, assembling the boxes, packing and stuffing them. Its all rather dreary work. I don't mind it, as orders are always a good thing, but its a bit mind numbing and since my stereo out there has gone kaput and I'm too cheap to replace it, I don't have any Blondie to brighten the job. But the orders have been packed and shipping all week and by a look on the boards folks are finally getting them. 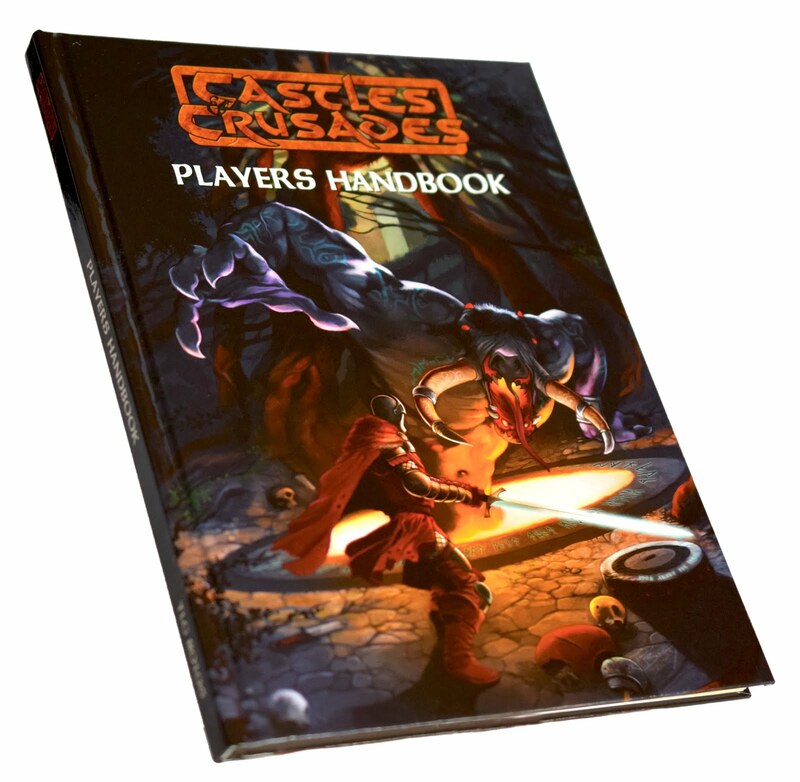 I am rather proud of this product, it came out very nice, Gary, Jeff, Peter and Jared all doing bang up jobs in putting together a really cool adventure and combining the setting material. Nice work and my hats off to them all. This has all be to the detriment of other items of course, I've put C2 aside for the week, and Crusader 8 is languishing, in need of my Alea iacta est article. I do hope to hit C2 or #8 pretty good this afternoon. I spent the rest of the week catching up with quarterly reports, balancing accounts and the like (as I was ill for the better part of the previous week). While all this has been going on Davis managed to finish and turn in Chimera's Roost and has returned to his own roost on the CKG. Peter is working on covers for G1 The Teeth of Barknash Nour. Mark continues to wrestle with various problems in the print shop but has (as of last night) cleared the station for action. All is well in the Troll Dens and next week looks to be clear of bumps and empty for lots and lots of writing.